The book is presented in two volumes and is divided into six parts. Each part is subdivided into sections and each section has several subsections. Each subsection begins with a brief account of relevant embryology, applied anatomy and physiology before dealing with the main topic. A sincere effort has been made by the contributors to deal with the subject in a comprehensive but concise manner avoiding repetitions. To help the readers understand better, the clinical problem and management approach, several tables, figures, algorithms, flow charts, diagrammatic sketches, pictures, etc. have been included, wherever possible. 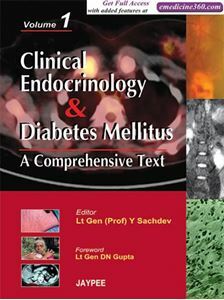 This is probably the first comprehensive textbook on Endocrinology and Diabetes Mellitus which is authored by some of the senior-most Indian experts in the field. It is intended to provide a linking bridge between the practice of clinical medicine and science of Endocrinology. The text is aimed to provide a condensed and authoritative approach to the management of various types of endocrinopathies. The treatise is based on updated scientific information obtained after screening the vast literature and expert clinical experience of some of the famed and better-known teachers and medical scientists. The book is targeted at medical consultants, general physicians, paediatricians, endocrinologists, diabetologists, ophthalmologists, graduates, postgraduates and post-doctorate scholars. It should also be of immense value to the undergraduates, nursing officers, nutritionists, dieticians, medical educators, teachers, researchers and all those who look after endocrine and diabetic patients. Chapter 18.1 to Chapter 30.6 available in Volume 2.